Kit Kat is one of the world's most well known chocolate bars. Originally created in England by the Rowntree company in 1935 and now sold around the world, Kit Kat's distinctive oval logo and bright red packaging is nearly as ubiquitous as Coca-Cola's. Look closely, however, and differences start to pop up... nowhere more than in Japan, which by rights should be renamed "the Kit Kat Kingdom". Indeed, Nestle's crispy chocolate covered wafer bar has not only found its true home in the farthest east, it rules there, baby! And it's done so by utilizing a time-honored marketing trick: never get boring. To that end, Japan's tireless legion of advertisers and product planners bring the country's sugar-shocked consumers a seemingly endless variety of Kit Kat flavors, one after another. Most are introduced as limited editions, out for a short time and then gone, replaced by something newer (and, often as not, stranger). 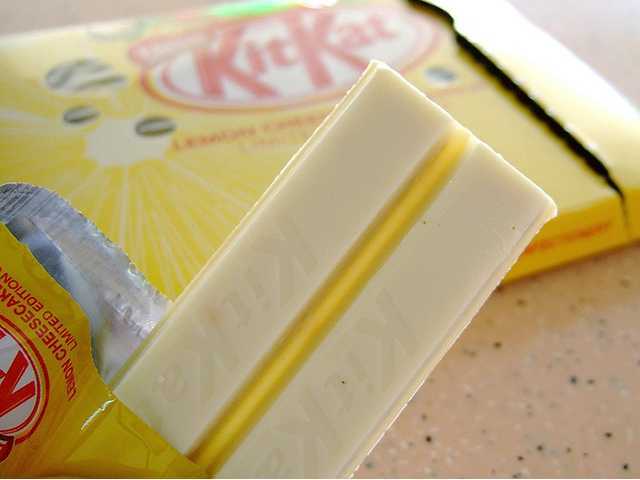 Lemon Cheesecake Kit Kat, anyone? 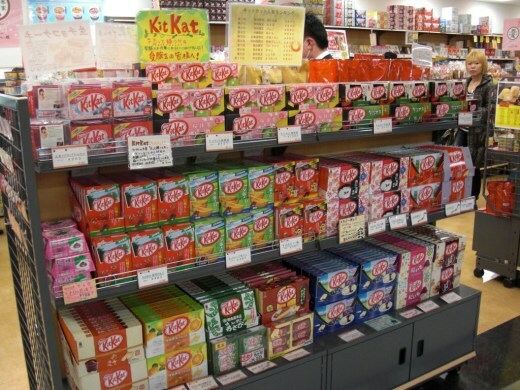 Without further ado, let's check out a few of Japan's legendary Kit Kat varieties. If there's one thing Kit Kat's marketers know, it's the home market. 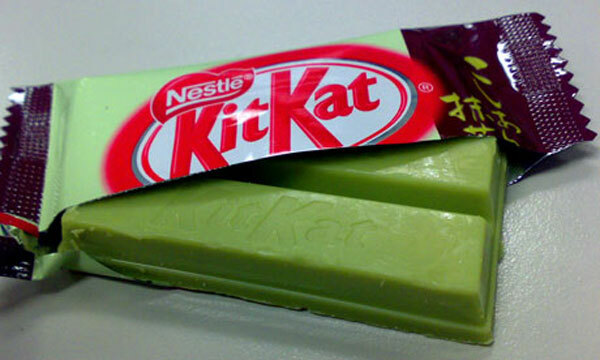 Witness a pair of flavors not likely to be sold anywhere else but Japan, Maccha Milk Kit Kat and Red Azuki Bean Kit Kat. The former is Green Tea with milk, an unlikely flavor for a chocolate bar but if there's one rule Japanese product planners hold most dear, it's that there ARE no rules. Don't believe me? 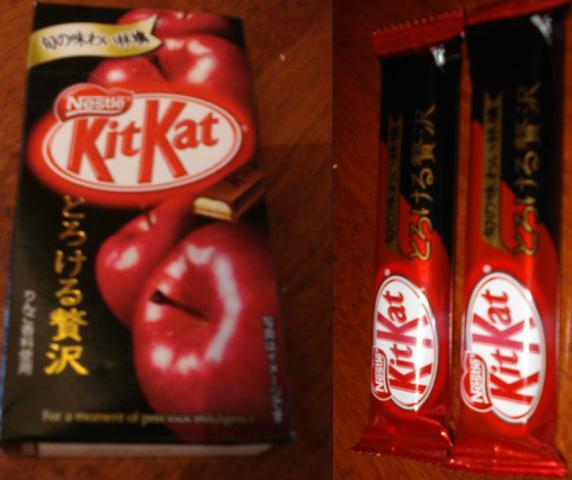 Consider Red Azuki Bean Kit Kat. BEANS, people. In a chocolate bar! Quite normal in Japan, mind you, where Azuki beans boiled with sugar have sweetened desserts and more for centuries. 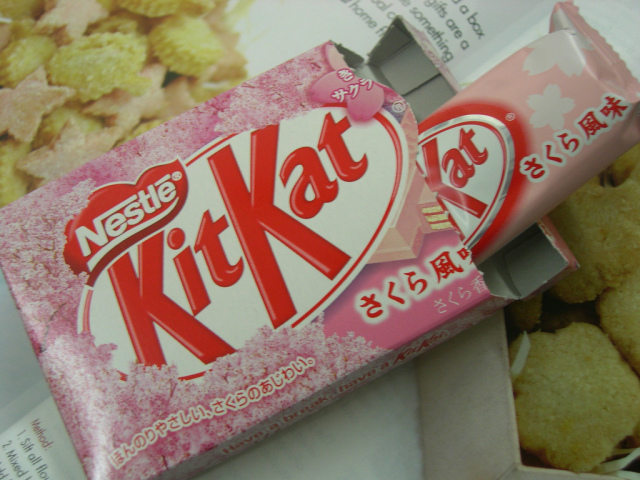 Then we have Sakura, or Cherry Blossom Kit Kat. Introduced in spring to coincide with the tradition of Cherry Blossom viewing, Sakura Kit Kat comes in a pretty pink wrapper and features crème-filled wafer coated in pink Cherry flavored white chocolate. 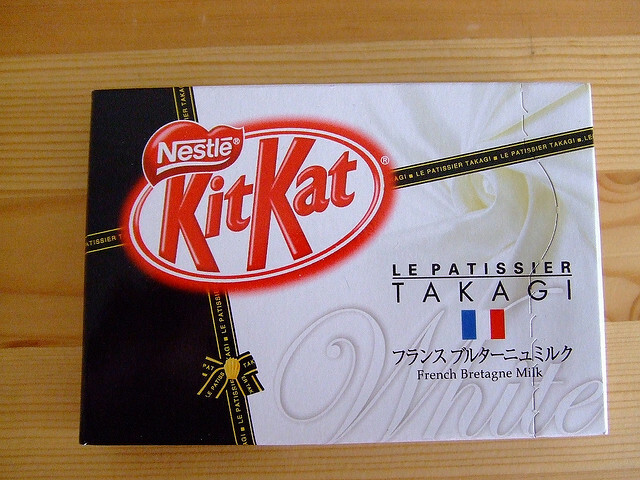 Often Kit Kats feature regional specialties such as white chocolate Kit Kat made with Hokkaido milk from Japan's far northern dairyland. One of the most unusual regional bars, though, has to be Yubari Melon . 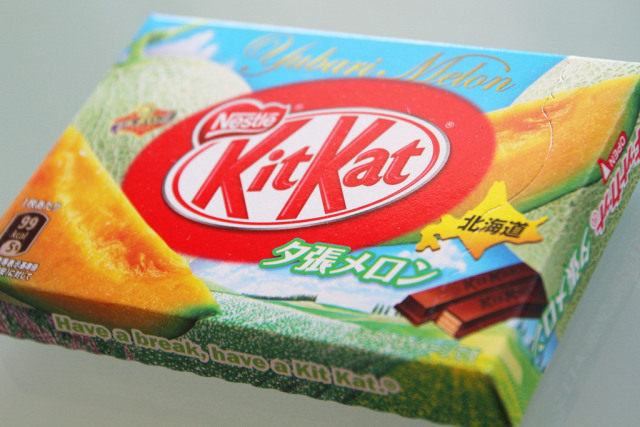 That's right, Melon Kit Kat - sounds like a recipe for bulimia if there ever was! When local influences run dry, don't give up, push that envelope! The result: Apple Kit Kat . Now, you may think that Apple and Chocolate just don't go together. Strawberry, yes, and there have been a large number of Strawberry Kit Kat variations over the years, but Apple? Imagine a nice strawberry fondue - except you're dipping apple slices into the melted chocolate. Sorry, my mind just can't grasp it. Leave it to a country that is oblivious to the ever-expanding sales of Kidsbeer, the frothy faux-beer for youngsters that topped my list of The Top Ten Weird and Bizarre Japanese Soft Drinks , to not bat an eye when Wine flavored Kit Kat was introduced. 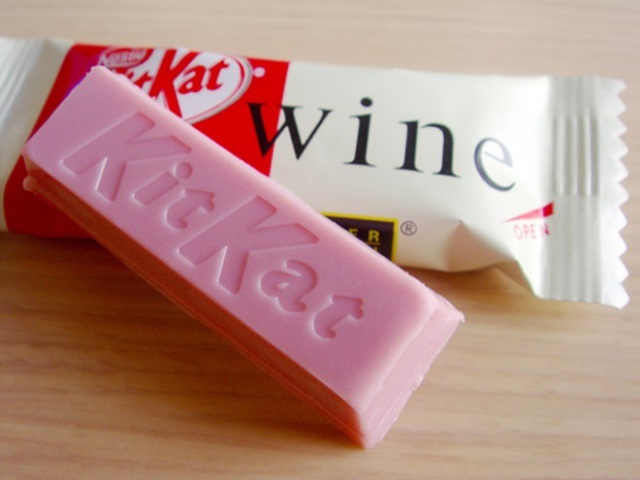 Now as opposed to the Apple variety, Wine Kit Kat is something I can accept, not to mention covet. Officially titled "Kit Kat Chocolatier Wine", this limited edition at least pretends to be adult-oriented. The petite-sized bars feature a luscious red wine flavored white chocolate coating over crisp wafers sandwiching layers of wine-flavored crème filling. A box of these would make a great gift - just don't bring them to your next AA meeting! This is only the tip of the chocolate covered iceberg - speaking of which, let's not forget Kit Kat I-Stick, a version meant to be eaten frozen. Sounds like something your mother would warn you against, but I digress. Then we have the luxurious signature editions made in collaboration with gourmet Japanese confectionary chef Takagi, including Bretagne Kit Kat, made with Bretagne milk and Ecuadorian cocoa butter. Anyway, the list of Japanese Kit Kats is long and getting longer by the month as new versions come down the pipeline. Wikipedia lists over 200 versions and counting. If this doesn't qualify as a national obsession, what does? In fact, the list of Japanese Kit Kats, past and present, would give a similar list of Hello Kitty items a run for its money. Hmm... Kit Kat, Hello Kitty, what is it with Japan and kitty kats, er, kitty cats? Should these two juggernauts combine forces, there's no telling what could happen! Just got back from T&T, a beautiful, brightly lit Chinese supermarket we often frequent. A browse of the confectionary aisle turned up two kinds of Japanese AERO chocolates: Peach and Maccha (green tea). The sugar beat goes on! And to think i thought america was crazy when they came out with the white chocolate ones. Also do you think they would ship the melon ones? Maybe, they should combine hello kitty and kit kats to produce edible live cats!!! What a great article. I just got back from Japan yesterday and brought with me an assortment of Kit Kat that also included banana, , raspberry, orange, lemon, and 61% cacao in addition to the sakura and yubari melon one from Hokkaido. I also saw a brandy one but alas one of my friends bought the last one before I had a chance to. Don't forget about Pocky, made by Glico (and a couple of other imitators like Fran). They come in a myriad of flavor combos, some seasonal. I work at a Japanese steakhouse and we have both Green tea and azuki red bean ice cream which are two of our most popular flavors. Maybe its not as unusual as it seems. WHERE THE HELL DO YOU THINK CHOCOLATE COMES FROM?!?!? BEANS!!!!!! this si most stupid note. this si most stupid note. Not all bean are the same. Cocoa beans has nothing to do with ordinary beans like faba, green, soya, ..etc beans. I know one person who can say such silly things. I guess each one knows one at least.!! Dont forget coffee beans, which are actually seeds of the coffee berry. A steaming mug of Kidney bean extract for ya? How do i get these scruptious delicacies in the US? Hi, these Japanese Kit-Kats are really delicious too, much more delicate than the domestics. Here in Toronto i can usually find a few varieties at some of the better Chinese markets. Cost is around $2 per bar, or between $6 and $10 for a bag of mini's. I've been able to enjoy Maccha Milk, Hokkaido White, Maple Syrup, Red Bean, Melon, Chestnut, Cherry, Strawberry and Orange Brandy so far - each one an exotic tasty treat. Check out Rinkya.com if you want some mailed to you from Japan. Where can I find a big variety in Japan? I go to 7-11 and grocery stores and have found about 10 different kinds; today I found watermelon. Is there a store in or around Tokyo that sells a lot of different flavors? The kit-kats sold in Japan vary by region. Some are absolutely limited to the region, such as the 信州　（Shinshu) apple kit kat above (it's made with, supposedly, flavors of that region's apples. Others, however, can be found by visiting various stations within the same city (particularly Tokyo). I had a friend visiting the past week and I found eight new flavors alone just by traveling around the Yamanote line. Other flavors are time-limited (like the Yubari Melon one above), and you just have to get lucky. I had an amazing caramel macchiato earlier this year. One of the better ones I've had recently is cookie kit-kat, which is simply replacing half of the wafers with a thin layer of oreo-like cookie, and a new version of apple kit-kat (I can't remember the official name). Brown sugar was a good one while it lasted... and Japanese lemon and pepper kit-kat (from Kyushu) was simply amazing in dark chocolate.